in North Indian recipes, Paneer, Side dish, Veg. Palak Paneer, this is one such dish which is known to all Indian people and all who have visited Indian Restaurant at least once. This one also according to me very delicate dish to prepare. I have tried this also in many different restaurant, but not all could please me either. I didn't have tried to make this so far at home as I didn't have any good recipe. But when I read Rak's Palak Panner recipe, I was quite sure, it would please me and my family's taste buds. I will recommend everyone to try her recipe. I followed her recipe as it is and it came out totally delicious, so flavorful and delicious. Go to her space for more such delicious recipes. To get a perfect palak paneer,we must take care to retain the green colour of the palak/spinach, also there should not be any smell of the palak, too. I will also recommend to use fresh spinach for this recipe, not packed mashed spinach. Preperation : Clean the spinach and remove the stem from the leaf. Chop a little. Boil water in a pan and add the paneer, switch off the stove and keep covered till use. Chop the onion and tomatoes finely. In a pan, heat 1/2 tsp of ghee and fry all the items in the To roast and powder table, except cumin seeds. Add cumin seeds lastly. Do not burn which will turn the gravy bitter. Keep aside. Then grind all together into a fine powder after it cools off slightly. Cooking : In the same pan, add the washed palak leaves and fry till it reduces in volume. The water in the leaves is enough to make it shrink. Transfer to a plate and cool down. Grind it with the green chillies and a pinch of salt. Heat oil in a pan and fry onions thoroughly till it turns golden brown. Add the turmeric and coriander powder and give it a quick stir in low flame. Add the tomatoes and little salt to make the tomatoes cook fast. Add the kassori methi now,while crushing them in between your palms. When the tomatoes turn mushy, add the ground spinach paste. Fry in low flame for 4-5 minutes till oil separates or till the raw smell disappears and the spinach gets cooked well. Drain the paneer and add it to the gravy. Add milk and mix carefully and bring to boil. Add the powdered spice. Mix well. Transfer to the serving bowl and serve with hot hot chapati, paratha or any Indian bread or rice. I had this with Green peas Kachori or Karaishutir Kachori, which I will post on my upcoming post. Labels: North Indian recipes, Paneer, Side dish, Veg. 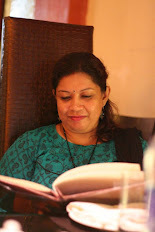 I am a die hard fan of Palak Paneer and am many times disappointed by the restaurant palak paneers... This looks delicious. Delicious and yummy looking palak paneer. Excellent preparation. 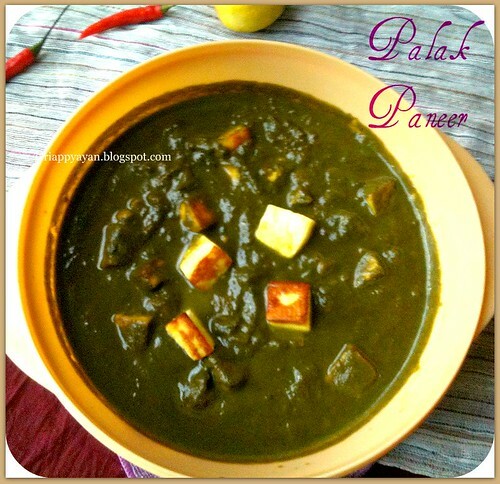 All time fav, palak paneer looks so tempting and delicious...nice preparation!! 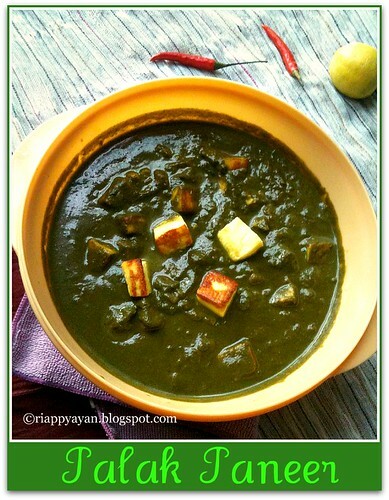 Ahhh..love palak paneer, looks super yumm!!! There are many ways to improve your cooking skills: reading great cookbooks, taking cooking classes, and good old fashioned practice in the kitchen are traditional methods. But these days, online cooking recipe videos are another excellent resource for aspiring chefs. Here's 21 sites that would help you get the most from the online healthy recipes and cooking videos you encounter. * Watch videos of Michelin chefs preparing meals, find easy beginner dishes, and more! 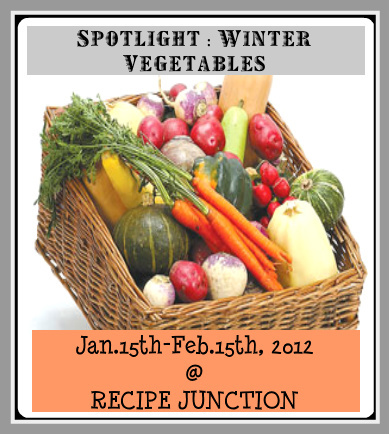 * A website that caters to those who love to both eat and prepare fine food. Whether you’re a novice cook or you know your way around the kitchen quite well, you’re sure to find something here that suits your tastes. *And last but not the least, for almost everyone: the CHOCOLATE LOVERS!